Last month my friend Bob's partner was in Brazil for a month visiting friends and family, so Bob kindly offered me the use of his kitchen. Isn't it beautiful? 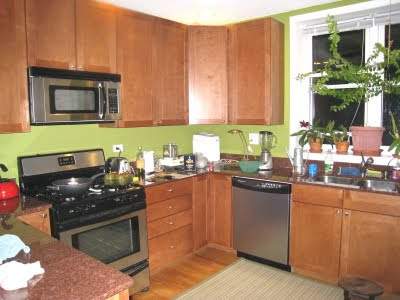 Look at all that wonderful counter space. My kitchen would fit in there four times over, I think. I got to use it twice and it was so nice being able to spread everything out without having to get creative with stacking dishes to make room for everything. I had big dreams of making a French dinner using recipes from Mastering the Art of French Cooking for Julia Child's 97th birthday, but August 15th came and went before I could make a plan, so that never happened. It's interesting to note that this cookbook has sold out since the movie Julie and Julia came out and the publisher has rushed a new printing. I wonder how many people who are buying the book now will actually cook from it? I didn't cook anything new the two times I made dinner for us. I decided to take advantage of the opportunity to test dishes I had made before, and to make any adjustments or refinements to them. For our first dinner, I made my Green Peppers Stuffed with Pork and Eggplant. Bob had expressed interest in it and it had been a while since I had made it so I was eager to see if it would taste as good the second time around. It did. I thought it needed salt; Bob said it was fine the way it was. I realized, as we were eating together, that no matter how delicious I think something is that I have made, I get super-critical of it when I share it with others. Then, all I can taste is what's wrong with it, and how it could have been better. I need to get over that, I think. On the side, I made fresh-from-my-new-boss's-garden kale, sauteed with pancetta, wholegrain dijon mustard, and balsamic vinegar. 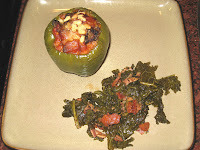 It was a touch more acidic than I like, but it complemented the pepper nicely and each dish lent balance to the other. The next time I was in Bob's kitchen, he brought out Bamboo (the green one on the left) and Guayaba (on the right), and fed them a snack. 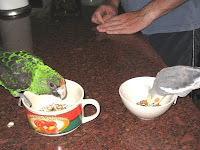 They were so cute perched on mugs on the counter that I had to take a picture. Bob and I went to chat in the living room while they snacked. Not long after we left them alone, we heard a large noise coming from the kitchen. We looked over to see poor Guayaba hopping around the counter, his cup twirling on its side. Bamboo just kept eating his seeds, as if he had been there all the time and hadn't deliberately knocked Guayaba off his perch. Too cute. I just had to make pizza my next time over. I'm so thrilled with the way it turns out that I am now making it on a regular basis, at least once a week. 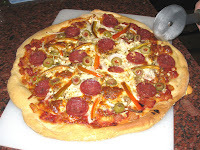 This pizza has my by now usual green olives and garlic, along with some beautiful peppers I got at the green market. I had some hard sausage on hand from a different use that I also put on the pizza. A sprinkling of Italian Seasoning added a nice rush of flavor as well. 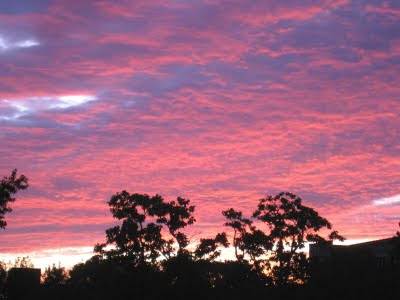 But even with all of the good company and good food, I think the highlight of my times in Bob's kitchen was the beautiful sunset sky that graced our fair city the second night. I don't know that I've ever seen a sky like this in Chicago before. It's the kind of sunset you will see on occasion in Texas, like the one I was lucky enough to capture here on one of my visits home. It was awesome to see it here in Chi-town. Delicious sounding meals, I am especially drawn to the kale (on of my favorite ingredients)! Thanks, Hornsfan. I've only recently started using kale, along with turnip, radish, kohlrabi and mustard greens. I'm sorry I didn't start to play with them earlier - they are so good and good for you. I love using a whole grain mustard with greens. I put it in the pan and let the seeds pop, and then I add the greens. It is delicious!